May 6, 2018/Sebo.Marketing/Comments Off on What Is a Rebounder? Why Is Everyone Rebounding? Rebounders are often confused with trampolines. Although the two appear similar in style and design, each serves its own purpose. If you’re in the market for a mini trampoline or rebounder, consider all the options available. Be mindful of what your device will be used for and make a purchase from that decision. Archaeologists have found remnants of trampoline devices in the ancient civilizations of Iran, China, and Egypt. Experts can’t agree on what the devices were used for, but the common theory is for religious ceremonies. The Inuit tribes of Alaska designed more modern trampolines. These trampolines were put into use to spot wild game from a safe viewpoint. Of course, the products were enjoyable and also part of entertainment. In the late 1930s, two gymnasts from Iowa State University began creating trampoline-type devices like those in use by trapeze artists. The men began to sell the device in the 1940s and the popularity grew from there. Today, many trampoline parks are popping up around the country. Children can bounce around buildings for fun and exercise. Are you ever jealous of your child’s jump parties? Well, we have an answer for you. Rebounding has a great number of benefits for health. The exercise is fun, great for your health, and can burn more calories than other common activities. Adults around the country are catching on to the trend and purchasing rebounders for their homes. 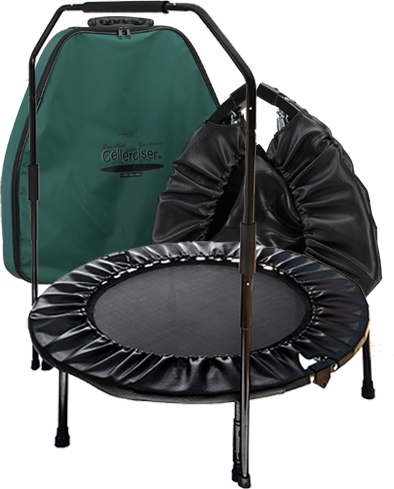 There are multiple online articles to help you decide whether to purchase a rebounder. It is quickly becoming a favorite exercise for adults looking for a way to change up exercise routines. The lymphatic system serves the important function of driving toxins out of your body. The system relies on our movement and gravity to work. During a rebounding workout, the bouncing body creates a vacuum to remove toxins and bacteria from the body. It puts your lymphatic system into overdrive, effectively cleaning out your system. There are no other exercise methods which force the flushing of toxins as well as jumping. In many studies, cellulite is blamed on stagnant lymph systems. The collection of fat cells is thought to be caused by lack of movement and distribution of fluids around the body. Women performing rebounding report improvements in cellulite appearance. The increase in lymphatic flow around the body can be useful for dispersing hereditary and non-hereditary cellulite. Cardiovascular exercise is a good method for burning calories and losing weight. Rebounding is a great way to introduce cardio into your routine. The act of jumping and forced bouncing against gravity will increase heart rate and metabolism. The result is more calories being burned and weight loss. It will also decrease the risk of developing heart disease. Unlike other traditional weight loss methods, rebounding is fun and doesn’t get boring after a week. Most types of exercise can improve posture. This is due to the increase in muscle mass and engagement of core muscles. When these muscles are well developed, posture improves without effort. Balance and coordination also see improvement after long-term rebounding. Rebounding requires balance, which will develop your overall coordination. As we age, we lose valuable muscle and bone mass. The result is poor posture, overall weakness,and osteoporosis. Rebounding helps prevent both of these losses from occurring. The bouncing motion increases the G-force on your body, effectively building mass. NASA astronauts have been using rebounders as a method to increase bone density lost in space. The process of jumping was found to be more effective in building mass than with running. The practice of rebounding has been shown to improve the results of other exercises.Weightlifters, yoga masters, and strength builders find rebounding to be a perfect complement toan already established routine. Many report better results from a combination of their exercisesand rebounding. Approximately 85% of the impact on joints are relieved by jumping instead of running. This method for exercise can save your ankles, knees, hips, and back from jarring exercises. The activity is a great method for elderly individuals and those with prior joint injuries. Many Americans suffer from high cholesterol, and rebounding can help. The exercise helps improve overall health and can limit the amount of bad cholesterol in your body. Some rebounders have been successful enough to no longer require cholesterol-controlling medicine. The habit of rebounding reduces the stress hormone in your body, allowing for less tension and stress. These effects, in combination with increased exercise, can lead to much better night’s sleep. Everything You Need to Know About Rebounders Rebounding isn’t simply jumping up and down. There are in-depth programs to provide calisthenics, aerobics, and strengthening exercises. Some moves are like what is seen in aerobic videos, except the moves are on a rebounder. There are also exercises available to target various muscle groups in only ten minutes a day. Rebounding provides many ways to exercise without getting bored. The Cellerciser program allows for many different muscle groups to be worked. The workouts will begin with a health bounce, followed by structured exercises. An added benefit to buying the Cellerciser is the comprehensive exercise program which comes with it. There are accessories available for use with the Cellerciser to make the experience better. A rebounder balance bar is available as an attachment. This device is useful for beginners and people still becoming comfortable with the rebounder. It allows for users to perform a limited range of exercises to avoid falls or injury. As you become more comfortable using the rebounder, it’s your choice to leave the balance bar in place or remove it. Cellercise videos are also available to change up your exercise routine. There are free basic exercise programs available online, but to take your workout to the next level, we recommend the DVDs. The activities in these videos are broken down by focus areas, such as weight loss or targeted areas. Each video features David Hall and provides recommendations for a ten-minute daily workout. Yes! Studies by NASA have proven jumping for health can be more effective than running. One of the biggest side effects often overlooked is the strengthening of the immune system and increased lymphatic efficiency. Both these factors can make a person incredibly health in the long-term. Increases in immune system efficiency have been shown to lower cancer rates. Strong immune systems can fight cancer cells before they develop into problems. The health benefits, including cardiovascular improvement and weight loss, can help users remain healthy into the later years. The low-impact exercise performed on the Cellerciser allows for people of all physical types to use it. Many of our clients choose to purchase the product after surgery in hopes of living a healthier life. When shopping for a rebounder, look for high-quality products to last a long time. A money-back guarantee is preferable, especially if you are purchasing the item online. Users should also buy rebounders with springs, rather than bungees. Bungees have a short lifespan and will wear out much faster than springs. Also, bungees tend to squeak and drive their bouncers a little insane. ← Mini Trampolines – Are There Any Differences Between Them?